A penultimate round place booked by Japan’s Yuya Oshima brought the quarter-final stage of the Men’s Singles event at the Seamaster 2018 ITTF World Tour Platinum Australian Open in Geelong to a close on the afternoon of Saturday 28th July. He beat the Korea Republic’s Jeoung Youngsik in six games (12-10, 9-11, 11-6, 8-11, 11-9, 11-6). The win was arguably the one upset at the quarter-final stage of the Men’s Singles event; presently Yuya Oshima is listed at no.50 on the Men’s World Rankings, Jeoung Youngsik is at no.37. 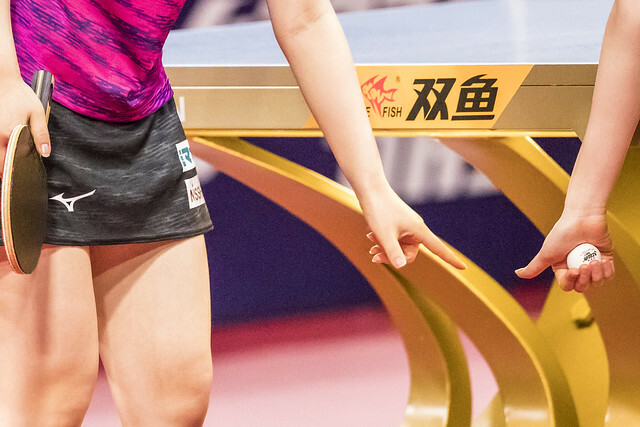 Furthermore on their most recent meeting, the opening round at the Seamaster 2018 ITTF World Tour Platinum German Open in Bremen, the decision had gone in favour of Jeoung Youngsik. However, one factor regarding of the result and without any shadow of argument was that a new name will be added to the Men’s Singles roll of honour at an ITTF World Tour tournament in Australia. Jeoung Youngsik, who had won when the tournament had been staged in Tweed Heads in 2015, was the only quarter-finalist present in Geelong ever previously to have reached the final. Success for Yuya Oshima also meant that the semi-final Men’s Singles line up is China versus Japan. In the lower half of the draw, Tomokazu Harimoto, like Yuya Oshima from Japan, had set matters in motion; the no.5 seed, he beat Chinese qualifier Zhou Yu (9-11, 12-10, 10-12, 11-9, 11-5, 11-5) and thus repeated the success of just over one month ago on the Seamaster ITTF World Tour in June when he had overcome Zhou Yu in the opening round on home soil in Japan. Success for Tomokazu Harimoto was followed by success for Xu Xin, the no.2 seed. He accounted for Germany’s Patrick Franziska, the no.14 seed (11-7, 11-3, 11-9, 11-9) and thus replicated the win of earlier in the year. He had prevailed at the Seamaster 2018 ITTF World Tour Platinum German Open when they had met at the quarter-final stage and also in the final later in the year at the Liebherr World Team Championships in Halmstad. Wins according to seeding; for Liu Dingshuo against Chinese colleague Yu Ziyang; both qualifiers, the win was as World Ranking suggests. Liu Dingshuo, listed at no.140, beat Yu Ziyang, named at no.257 in seven games (11-9, 11-3, 5-11, 11-8, 6-11, 5-11, 11-8). At the semi-final stage Xu Xin meets Tomokazu Harimoto, Liu Dingshuo opposes Yuya Oshima; the matches will be played later in the day in the evening session of play.